The climate of Ireland is mild, moist and changeable with abundant rainfall and a lack of temperature extremes. Ireland's climate is defined as a temperate oceanic climate, a classification it shares with most of northwest Europe. The country receives generally cool summers and mild winters. It is considerably warmer than other areas on its latitude, because it lies in the north-eastern Atlantic Ocean, and as a result is warmed by the North Atlantic Current all year. January and February are the coldest months of the year, and mean daily air temperatures fall between 4°C and 7°C during these months. July and August are the warmest, with mean daily temperatures of 14°C to 16°C, whilst mean daily maximums in July and August vary from 17°C to 18°C near the coast, to 19°C to 20°C inland. The sunniest months are May and June, with an average of five to seven hours sunshine per day. Atlantic depressions winter storms, occurring mainly in the months of December, January and February, can occasionally bring winds of up to 120km/hr to 140km/ with the winter of 2013/14 being the stormiest on record. The summer months, and particularly around late July/early August, thunderstorms can develop which can lead to flooding. Extreme heat and cold are both rare throughout the Ireland. Summer temperatures exceed 30°C usually once or twice every decade for example here are some of the year this has happened recently (2016, 2013, 2006, 2005, 2003, 1995, 1990, 1989, 1983, 1976 & 1975) The highest temperature ever recorded in Ireland was 33.3 °C at Kilkenny Castle, on 26 June 1887. The lowest temperature was -19.1 °C at Markree Castle on 16 January 1881. The sunniest months are May and June in Ireland. During these months sunshine duration averages between 5 and 6½ hours per day over most of the country. Rosslare, County Wexford is the sunniest area, and receives on average 4.38 hours of sunshine per day The least sunniest parts of the Ireland are generally the west and northwest of the country. As you know in Ireland rainfall is not a rare thing. Some parts of the west coast receive over four times as much rain as the east coast. The biggest reason and factor Ireland sees so much rain is due to the Atlantic Ocean and frontal systems moving over the country, bringing cloudy conations and rain. The average amount of wet day or days with rain are 151 days a year along the east and southeast coasts, to about 225 days a year in parts of the west. The station with the highest mean wind speed is Malin Head, County Donegal; averaging at 16.3 kn (30.2 km/h). Malin Head also receives the most gale-force winds, recording them on average 66.0 days per year. The station with the lowest mean wind speed is Kilkenny, County Kilkenny; averaging at 6.5 kn (12.0 km/h). The highest wind speed ever recorded in Ireland was 103 kn (191 km/h) at Fastnet Lighthouse, County Cork on 16 October 2017 during ex hurricane storm Ophelia. Most low-lying regions of Ireland only see a few days of lying snow per year (from December to March), or may see no snow at all during some winters. Due to the variability of Ireland's weather (which is mainly because of the influence of the Atlantic Ocean, Gulf Stream and North Atlantic Drift, as well as Ireland's northerly latitude and vulnerability to Siberian/Arctic winds) weather during the winter months is difficult to predict. End of February in March 2018 seen record breaking snowfall in Ireland with up to 30cm recorded in parts of the east and drifts over a metre high. 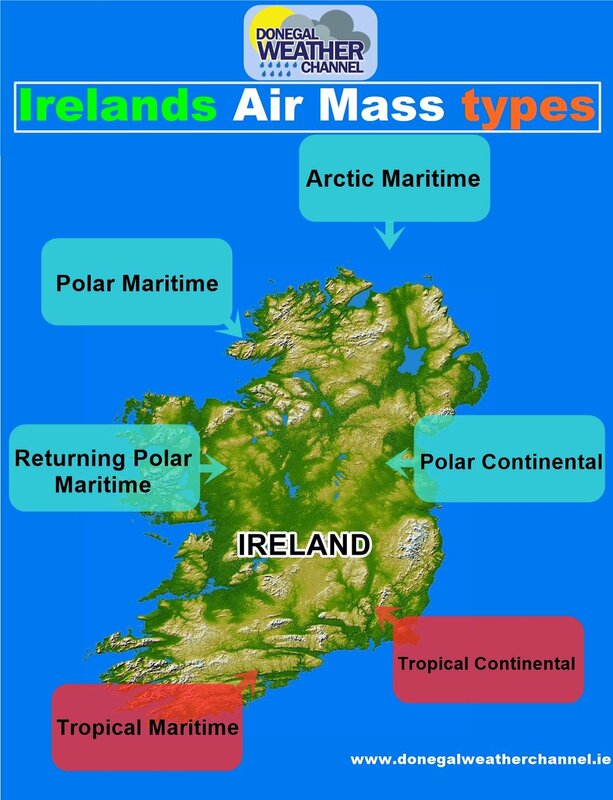 There are a total of six air masses that affect the Ireland and the UK, below you will find the 6 different types. A Tropical maritime air mass comes from the warm waters of the Atlantic Ocean between the Azores and Bermuda. The wind direction normally associated Tropical maritime is a south-westerly wind. In winter this air mass will lead to Mild and damp weather with overcast skies and rain. During summer this air mass leads to very warm and muggy weather. It also will give you good sunshine and warm temperatures. A Tropical Continental air mass comes from the region of Africa and desert regions. The wind direction normally associated Tropical Continental is a south to south-east wind. During summer this air mass leads to warmest weather and can lead to record breaking temperatures. It also will give you good sunshine, dry weather and hot temperatures. If you are looking for a real heat wave this air mass will give you that. It is the least common air mass to affect Ireland and the UK. A Polar Maritime air mass comes from the region northern Canada and Greenland. The wind direction normally associated Polar Maritime is a north-westerly wind. In winter this air mass will lead to a mixture of rain, hail, thunder and even snow over some western and north parts, Showers in this airflow is are fairly frequent. Showers would be less across the eastern half of Ireland and the UK. A Polar Continental air mass comes from the region Russia and Eastern Europe The wind direction normally associated Polar Continental is an easterly wind. In winter this air mass will lead to the coldest conditions with severe frosts, heavy snow and ice depending on its track. If the air tracks main over land and has a short sea track it will just be severe frost and ice but some nice sunshine and clear weather too. If this travels for a longer period over the sea then it can be accompanied by heavy snowfall mainly for eastern parts of Ireland and the UK due to the sea streamer affect. This is due to the air becoming unstable and moisture rising from the warmer sea water temperatures giving rise to heavy convective rain, hail and snow showers. For a example at the end of February and start of March 2018 Ireland was under the influence of Polar Continental air mass also known as the beast from the east. This lead to heavy snowfall over the eastern half of the country and broke snowfall records. To add in the mix an area of low pressure which was from a warmer air mass and had a lot of moisture moved up from the south moving northwards towards Ireland collided with this cold Polar Continental air mass. Instead of the precipitation falling as rain as it normally does when a area of low pressure moves up from the south it fell as heavy snowfall when it mixed with that very cold Polar Continental air mass. The area of low pressure was named by the Portuguese Met Office as Storm Emma. During that spell of weather Ireland seen its first red warning for snow and ice issued. The most common time to see a Polar Continental air mass would be between November and April. During summer this air mass would bring you warm weather with temperature getting into the mid 20s to high 20s with nice sunshine. An Arctic Maritime air mass comes from the region of the Arctic Ocean and North Pole. The wind direction associated with a Arctic Maritime air mass is an Northerly wind. Arctic Maritime air will give you a spell of cold weather over winter especially if there is a strong winds blowing which would make it feel much colder due to the wind-chill factor. In winter this air mass can lead to heavy snowfall and hail especially if you have a polar low system that forms and moves southwards. Areas which see the heaviest snow from this set up would be northern parts of Ireland and the UK. An Arctic Maritime air mass would not be as cold as a Polar Continental air mass which I talk about above. During summer this air mass can also occur but very rarely. It won’t be as cold as the winter months but when it does occur over summer this air mass would give you colder than normal temperatures, rain and even thunderstorms.